Ok. So there´s some truth in this. Positive psychology indeed tries to understand the role of positive emotions in the good life. But they are only one of the five key elements in Martin Seligman´s PERMA concept. I guess most positive psychologists would agree that – at the end of the day – concepts like meaning in life and positive relationships are more important for a life well-lived. Additionally, it is important to acknowledge that positivity is not (only) and end in itself. It may be a powerful way to attain other important things in life (e.g., success at work). While there´s nothing wrong with kitchen sink psychology per se, it has to be noted that laypersons get things wrong a lot of times. Even though we should be all experts at living (because that´s what we do all day long…), many people bear serious misconceptions on what makes for a good and happy life. This is where positive psychology as a data-driven science steps in – and often comes up with counterintuitive findings. For instance, if you´re into social media, you´ll know all this TGIF (Thank God it´s Friday) stuff people put on Facebook and Twitter on Friday afternoon. But scientific inquiry time and again is able to show that most people are happier while at work compared to their leisure time. Positive Psychology is not Positive Thinking! For sure, there are similarities in the subject matters of positive psychology and positive thinking. By way of example, both are concerned with cultivating optimism in individuals, since being optimistic (most of the time) is associated with an array of beneficial outcome variables. The difference is: positive psychology is a science. It´s grounded in thorough academic research. Of course it´s possible to arrive at correct conclusions without conducting large-scale studies – but personally, I feel a lot better when what I recommend to my clients is based on coherent theories and scientific evidence. This point is closely connected to the aforementioned one. Positive psychology is spear-headed by some of the most widely acclaimed psychologists of our time. Among them are Martin Seligman, former president of the American Psychological Association, Mihaly Csíkszentmihályi, and Barbara Fredrickson. And: Daniel Kahneman, Nobel Laureate of 2002, also is among the major contributors to the literature on psychological well-being. Among other things, he´s a co-editor of the seminal book Well-Being: The Foundations of Hedonic Psychology. Yet, the crucial difference between these people and the common self-help guru is not the length of their Wikipedia articles – it´s something else that can be found in this post. Once again: positive psychology is not about being happy-smiley all day long. It is not trying to eradicate “the Negative”. It´s just that psychology as an academic discipline has very much focused on negative phenomena (such as fear and depression) for the first hundred years. Positive psychology wants to point the spotlight to the positive side of our emotional and behavioral continuum in order to create a more balanced view of human functioning. Actually, negative events and emotions play a crucial role in studying so-called post-traumatic growth which basically is concerned with the question: How can we profit in the long run from going through really hard times in our lives? This concern was issued in a recent article by James (Jim) Coyne, Ph.D., a Clinical Psychologist and Professor at the Department of Psychiatry, University of Pennsylvania – the same university that Martin Seligman is teaching at. Again, there´s a grain of truth here. 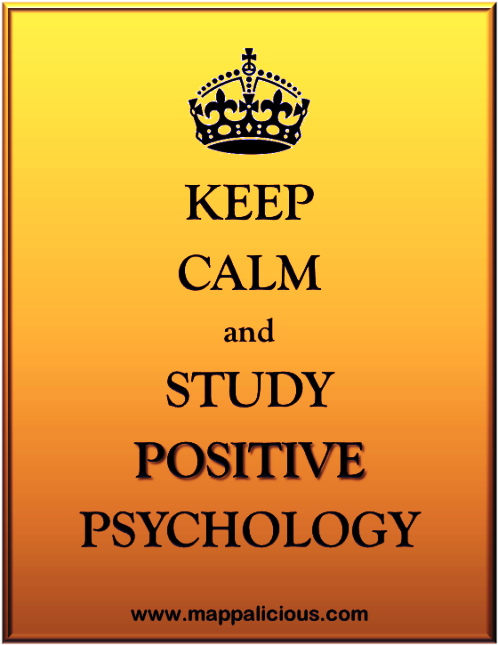 Positive psychology was coined at several high-end private universities in the U.S. As with virtually all psychological theories, they are first tested empirically using samples of undergraduate students at those universities the researchers teach at. And since these tend to be predominantly affluent white people, there´s is some truth to that criticism. But once again: that´s true for almost any piece of research in any branch of psychology out there. Positive psychologists do acknowledge this caveat and continually try to broaden their (research) perspective, reaching out to international samples and other diverse target groups. Positive psychologists readily do acknowledge the theories and findings that came out of Humanistic Psychology, thereby standing (partly) on the shoulder of giants like Abraham Maslow and Carl Rogers. Additionally, positive psychology draws heavily on the ancient wisdom of some of the great philosophers. A lot of positive psychologists seem to be very fond of William James, and especially Aristotle and his conception of Eudaimonia. The crucial difference once again is positive psychology´s strong foundation in (experimental) research.